Check out the NEW Nickelodeon in Punta Cana! Looking for the BEST All Inclusive family resort in Punta Cana? Check out the NEW Nickelodeon in Punta Cana! 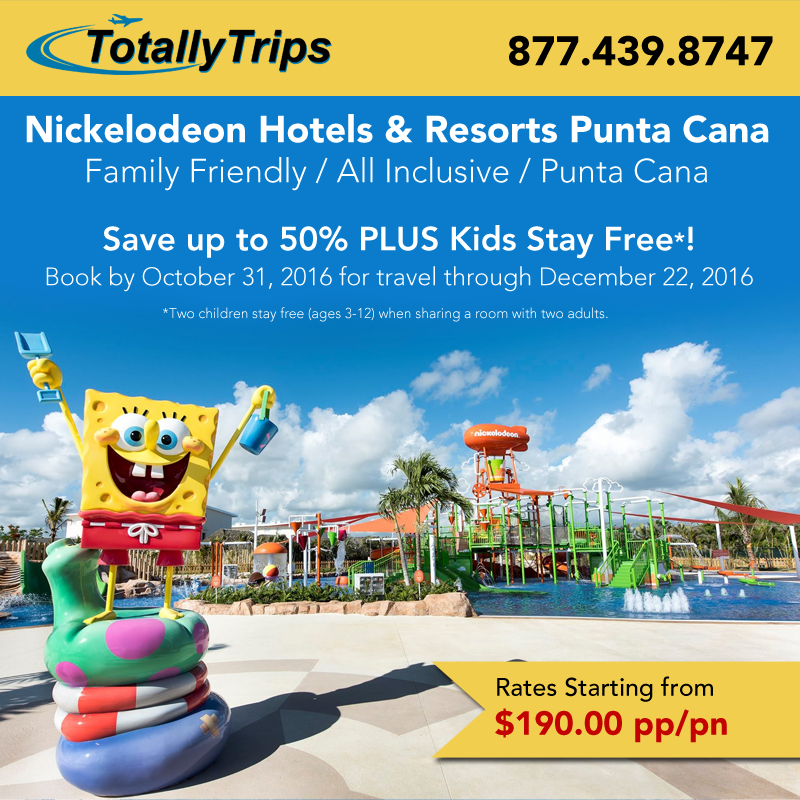 Learn more about this resort and book today at: http://www.totallytrips.com/resorts/nickelodeon/punta-cana/ or call 877.439.TRIP today! 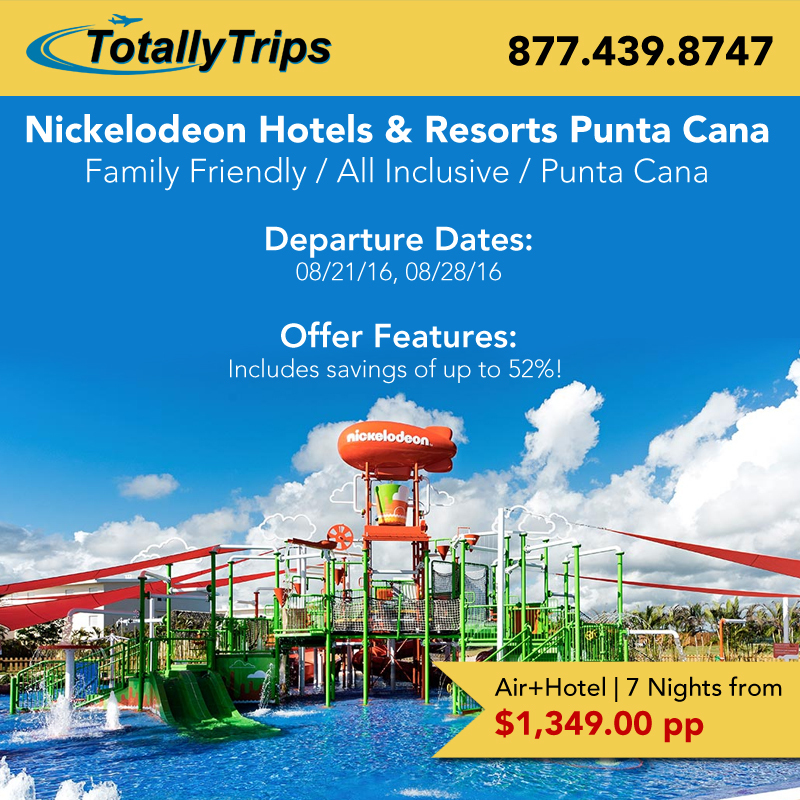 Visit Nickelodeon Hotels & Resorts Punta Cana This January! Are you ready for a Sponge-tastic vacation the whole family can enjoy?! The resort features 208 oversized suites filled with comfortable amenities to cater to every taste and need. Our glamorous and spacious Swank Jacuzzi Suites, the one-of-a-kind Pineapple Villa, and a wide variety of upscale accommodations all feature playful décor that brings out the inner kid – or the actual kid – in every guest. At Nickelodeon™ Hotels & Resorts Punta Cana, a Karisma Gourmet Inclusive® Resort, we invite you to discover a new kind of all-ages vacation. From the Aqua Nick™ playground to our luxurious spa, we make sure that every guest has the experience of a lifetime. The first resort of its kind in the Caribbean (and the world!) this five-star vacation destination brings the spirit of infinite play to every minute of the day. The resort features 208 oversized suites filled with comfortable amenities to cater to every taste and need. Our glamorous and spacious Swank Suites, the one-of-a-kind Pineapple Villa, and a wide variety of upscale accommodations all feature playful décor that brings out the inner kid – or the actual kid – in every guest. Personalized service is at the heart of the Karisma philosophy. Our friendly staff is waiting to indulge your every whim and will make sure your stay is filled with happy surprises. So join us on the golden sands of Uvero Alto Beach, just 60 miles north of Punta Cana Airport. Your family (or family of choice) will never forget the colorful waterslides and pools, hanging out with their favorite Nickelodeon characters, hilarious Slimings and the famous Karisma Gourmet Inclusive Experience!